At the Alarming Company, we believe that installing your new alarm is only the start. Our monitoring services and engineers are on hand 24/7 to ensure that you and your property remain secure. We offer maintenance plans to simplify the upkeep of your intruder, CCTV and personal access systems. 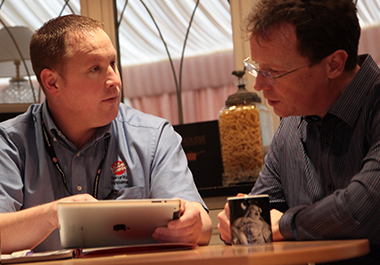 And should your requirements change, our security consultants can advise on how best to meet them. A maintenance contract is a prudent way of protecting your investment in your system – ensuring your equipment is kept in good working order so it won’t let you down when you need it. We not only offer maintenance plans for systems we install, but can offer a similar service for those installed by other companies. Contact us today to find out more. We ensure that your alarm stays fully operational and attend to any problems without delay. As you would expect, we carry out regular and full inspections. Audible only alarms are carried out once a year, whilst signalled alarms and more complex systems are serviced twice a year. It is important to note that if your signalled alarm is not maintained, you run the risk of losing police response. For any alarm system, your comprehensive warranty is affected if you are not covered by a maintenance contract. Is maintenance a condition of your insurance policy? Many insurers offer a discount if a property is protected by a regularly maintained intruder alarm. One of the most important aspects to any alarm system is the response it achieves upon activation. Through our partner organisations, we offer a fully comprehensive monitoring service that can assess any alarm and then contact either your own key holders, a professional key holding service, or the police. In the event of your alarm activating, it is important that we hold details of who should be contacted. This is particularly important if we are providing you with a monitoring service. Should the details of your key holders change, please download the form below, complete, sign and return it to us. We will contact you when your system requires maintenance. Depending on the system we installed, we may also know when it goes wrong. However, if you would like to arrange a service call, please use the form below. If you think that your home and family could benefit from a CCTV system from The Alarming Company, contact us today to arrange a free, no obligation survey. Call us on 01329 314444 or click the buttons below. You captured our requirement perfectly. We didn’t know your engineer was on site, he was not only great at his job but spent time with my wife making sure she understood the installation, we are both very grateful.